Summary of today’s show: Since Vatican II, Catholics as a whole have been gaining a deeper appreciation for Scripture, but there’s so much more to do. Scripture scholar Fr. Tommy Lane joins Scot Landry and Fr. Chris O’Connor to talk about the importance of reading, studying, and praying with Scripture, even to venerating Scripture as we venerate the Eucharist. Let this Lent be a time when the Word of God takes deeper root in your life and brings you closer to the Lord as you contemplate His “love letter” to all men and women. 1st segment: Scot and Fr. Chris talked about Fr. Chris’ visit to Norfolk state prison last night to celebrate Mass with the inmates. Fr. Chris noted that the congregation included a dog, because one of the inmates trains service dogs for the disabled. He told the men that Lent is a boot camp and we use this time to chip away at those things in our lives that aren’t Christ-like. 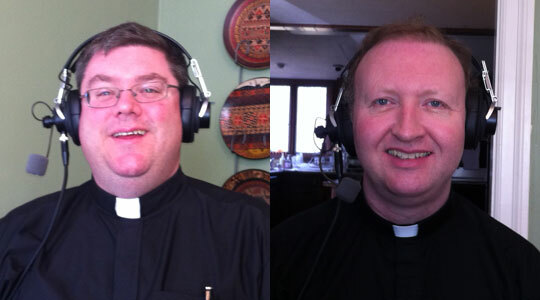 Scot asked what changes happen in the season of Lent at St. John Seminary. Fr. Chris said throughout Lent they have a book or two that they read in the refectory during lunch, about 15-20 minutes of reading, instead of conversations. They are also served soup and bread on Wednesdays and Fridays as a Lenten fast. On Fridays, where the men usually go out for pizza or a movie the rest of the year, during Lent they spend the time in the Stations of the Cross. This year, they are reading a book on Blessed Charles Foucauld and the imitation of Christ. Fr. Tommy Lane is the guest. He’s on a sabbatical from Mount Saint Mary’s Seminary in Emmittsburg, Maryland, in Boston for study and spending time at St. John’s Seminary while he’s here. He is a Scripture scholar. 2nd segment: Scot welcomed Fr. Tommy to the show. He grew up on farm in County Cork, Ireland. He has one brother who is now looking after the dairy farm. He grew up in the country, which is a nice place to think about God and vocation. He was in second grade when he first began to think about. It was watching the priest celebrate Sunday Mass. Near the end of high school, he met the vocations director and then went to seminary where he studied Latin and Greek. He studied his theology at Maynooth near Dublin. He went on to Rome for graduate work in Scripture study where he earned degrees, including a Doctorate in Sacred Theology. Fr. Tommy said there was something about the priest in the sanctuary that attracted him to the idea of priesthood at such a young age. Scot asked when Fr. Tommy’s love of Scripture began. Fr. Tommy said about halfway through high school he began to read the Bible every evening before bed. One of the Sisters of Mercy in the high school teaching religion who made everyone in class buy a Bible and they would read it in class. Scot asked how seminary formation in Ireland is different. Fr. Tommy said back in the 80s, they didn’t have formation advisors at the time. Also every seminarian does pastoral work for a half-day every week. At the time, it was optional and there was much less emphasis on it. There is one seminary for Ireland, St. Patrick’s College in Maynooth. All the smaller diocesan seminaries have been closed and merged with Maynooth. After ordination, he continued with all his studies and after getting his doctorate, he served in various parishes. He also taught adult education in his diocese every week, several weeks. From there he taught in the seminary in Ireland and when the one he taught at closed, the bishop told him to apply to any seminary to teach Scripture. A priest friend in America told him of an opening at Mount Saint Mary’s in Maryland and he applied. Fr. Chris said one of the hardest degrees to earn in Rome is the Scripture degree Fr. Tommy earned. The hardest part for him was the Hebrew. He’d already studied Greek in undergraduate, but Hebrew is so completely different from any languages he’d known. Every word is formed with three consonants and the vocabulary is limited so you make words by adding prefixes and suffixes. But it’s great to read the Scriptures in the languages in which they were written. During exams, you would be allowed to bring Scriptures with you to quote from, but they only allowed the Greek and Hebrew Scriptures. Fr. Tommy said reading in Greek and Hebrew allows more precise understanding of what was being said than reading the translation in English. He cited the Annunciation, which in English usually just has Gabriel says “Rejoice, o highly favored daughter” or “Hail, full of grace”, but the Greek word used there carries a lot more meaning, such that the angel is saying to Mary that she is full of grace in such a way that she has always been full of grace, which infers the state of the Immaculate Conception. Scot asked how Scripture was developed and what languages was it written in? Fr. Tommy said the New Testament was written in Greek and the Old Testament was written in Hebrew and just a very small part in Aramaic. When he studies the New Testament, he studies it in Greek. It was translated later in all the various languages. He said biblical Hebrew and Greek are not the same as modern Greek and Hebrew, although he can sometimes understand many of the words he sees. The Hebrew he learned has vowel signs in it, while modern Hebrew does not, which makes it difficult for him to read, for example. 3rd segment: Scot said most Catholics don’t have a deep appreciation for Catholics and asked Fr. Tommy why that is. Fr. Tommy said there may be some historical reasons, but Catholics are reading Scripture much more now. However, Catholics have always meditated on Scripture in the Rosary and in the Mass and in other indirect ways. Scot guesses half of all Catholics have never read a book of the Bible from beginning to end. He said the Scriptures are a love letter from God to us, as Vatican II said. Fr. Tommy said when you have a conversation with someone there is some content. When you pray, you want to nourish your prayer life. Scripture does those. He tells people to read a passage of Scripture before you pray, to help you enter into a deeper prayer life. He suggests people pray for the Holy Spirit to open up the Scripture to them. Scot asked what central things he tries to teach Catholics who come for their first Scripture course. Fr. Tommy said he always starts with the inspiration and composition of the Scriptures. One common misunderstanding is that the Scriptures just sort of fell out of heaven. Of course, God is the Author of the Scriptures, but people don’t understand the human element involved in the composition of the Scriptures. At Mass we say “The holy Gospel according to Luke” because it is Luke who put it into writing and his character comes through. Scot said the human authors are not God’s robot, but he is inspired to write what God intends to be written. Fr. Tommy said they were real authors. Fr. Tommy spoke of the difference between teaching Scripture to seminarians and teaching it to lay adults in faith formation. He would tell laypeople that we can read Scripture, we can study it, we can pray it, and he wanted them to do all three. About halfway through each night, they would pause for a 15-minute guided meditation on Scripture, which turned out to be the most popular part of the programs. In seminary, he doesn’t need to do that because they already have spiritual directors and others teaching them to pray with the Scriptures, so he can dedicate his time to more academic study of the Scriptures. Seminarians must get an academic understanding of the Scriptures. Fr. Chris asked Fr. Tommy which one of the Gospels he would take with him to a desert island. Fr. Tommy said that would be Luke, who is sometimes called the Gentle Scribe. He likes his portrayal of the gentleness of Christ, who is always reaching out to others, especially those on the margins. Fr. Chris said he’s heard it as the Gospel of hospitality. Scot asked if Luke is more Marian than the other two synoptic Gospels, Mark and Matthew. Fr. Tommy said we could say that because the Christmas narratives come from Luke, with so much about Mary in the Annunciation and the Visitation and the Nativity. Fr. Chris asked Fr. Tommy to explain what are the synoptic Gospels. Fr. Tommy said synoptic is two Greeks words meaning “seeing together”. Those Gospels have avery similar presentation of the life of Christ. Those are MAtthew, Mark, and Luke. John has a different presentation, where he goes to the Passover in Jerusalem three times, instead of the one in the others, and he gives long speeches instead of the parables in the others. Scot said the synoptics are more about what Jesus did while John is more about who Jesus is and what he does for us. Fr. Tommy said the Last Supper Discourse in John is Jesus giving his instructions for the Church, which is why we read the Gospel of John in Easter season. Scot said during the season of Lent we encourage people to deepen their knowledge of God and grow in faith. What would we encourage moms and dads and their kids to do to grow in Scripture during Lent? Fr. Tommy said when praying with young children, use one paragraph, perhaps from one of the Gospels with Jesus in it, something that would appeal to the kids, to love Jesus and show Jesus’ love for them. For an adult studying for themselves for the first time, he suggests two ways: the Scripture readings from daily Mass or pick one Gospel and read it from beginning to end. You might want to pick up a commentary on the Gospel to help, for example, the Navarre Bible Commentary. In Lent the two readings for daily Mass are especially chosen because they connect with each other in some way. The rest of the year, they are not chosen to be linked in a particular way. 4th segment: Scot said on Fr. Tommy’s website, he saw something from one of the courses he teaches that he’s never seen before. He said that we should venerate the presence of God in the Scriptures as we would venerate the presence of God in the Eucharist. Scot said he doesn’t know many Catholics who venerate the Word of God with that same passion as they devote to Eucharistic adoration. Fr. Tommy said Cardinal Arinze has made that phrase famous. What Fr. Tommy does is that he has a special place in his rooms for Scriptures to give them a place of prominence in your home. Scot said it’s easy to have the Bible on a shelf among other books, but its better to put God’s love letter to us in a special place. Fr. Tommy said it’s different from all other books. Fr. Tommy said it’s appropriate to have the family Bible blessed by a priest. Fr. Chris said you often see the four evangelists represented by an ox (Luke), an eagle (John), an angel or man (Matthew), and a lion (Mark). Fr. Tommy said they are taken from the four creatures in the Book of Ezekiel and the Book of Revelations. The eagle is John because John has such lofty theology. Luke opens with the angel Gabriel appearing to Zechariah, the priest sacrificing in the temple, and oxen were sacrificed in the temple. Matthew is normally said to be a human, which refers to the gospel opening with the family tree of Jesus. And Mark is a lion because it opens with John the Baptist preaching int he wilderness, roaring like a lion. Fr. Chris asked Fr. Tommy what he does to prepare a homily as a Scripture scholar. Fr. Tommy begins preparing on Monday before Sunday’s Gospel. He uses it for prayer and meditation and focuses on what the Lord might be saying through the Scriptures to his people. As the week goes on, he reads Scripture commentaries and might look for answers on various questions that arise and tease out deeper meanings of the passage. Scot said Fr. Tommy publishes his homilies on his website and over time the same readings elicit different ways to approach them. Fr. Tommy said God is always speaking to us in a new way through Scriptures. He’s trying to link with the lives of the people he’s speaking to. There may be situations or questions that cause people to seek answers. He wants Scripture to meet people where they are in some way. Scot said at the end of Lent we read some of the most powerful Scripture passages starting with Palm Sunday and ending on Easter. Some say the Palm Sunday Passion reading so long that it’s tough to get everything out of them. Fr. Tommy said reading the Passion at home beforehand would be great. We should understand how the Passion narratives work: Last Supper, Gethsemane, Jesus arrest, the religious trial before the Sanhedrin, the civil trial before Pilate, the condemnation,. and Jesus carrying his cross. Seeing this structure in can help guide us through it. Fr. Tommy finds the way we read the Scriptures helpful, with the congregation saying the words of the crowd. We don’t like to think about it, but it’s because of our sins that Christ is crucified. Scot said when we in the pews say “Crucify him” we in some ways might not want to acknowledge it and it’s very difficult for him to say this because its by our sins that we are saying “Crucify him”.Every time we sin, we choose Barabbas instead of Christ. Fr. Chris said one of the men at Norfolk told him that we forget that Barabbas was the first man that Jesus saved. For people who want to deepen their lives in Scripture, they can read Fr. Tommy’s homilies on his website and there’s also a few excerpts of Scripture courses. He’s on sabbatical right now to write a book on priesthood and Scriptures. The first part is on priesthood and the Old Testament. The second is on Christ the high priest of the New Testament. The third section is Christ sharing his priesthood in two ways with his apostles and the lay faithful.